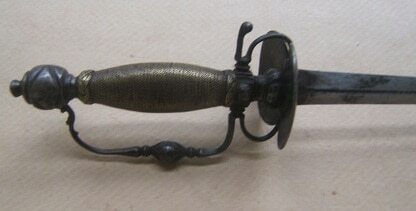 A FINE SCARCE & UNTOUCHED FRENCH & INDIAN/REVOLUTIONARY WAR PERIOD CHISELED-STEEL HILT SMALLSWORD, ca. 1750: In overall fine untouched condition with smooth steel-gray surfaces Diamond-form, 25″ chiseled steel blade with a decoratively line-etched base, double cutting edges and a fine point. Retains 75% polish with some scattered light discoloration and smooth gun-metal-gray surfaces. Deeply chiseled and faceted Steel Hilt of classic French smallsword form. 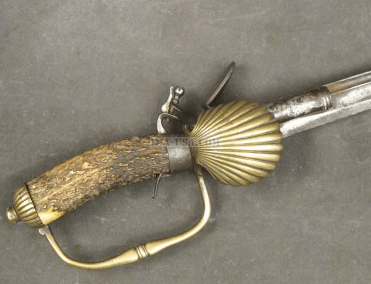 Complete with its original, faceted, ball-shaped pommel, its double shell-type guard with line-engraved borders, its braided Bronze wire-wrapped grip and its faceted knuckle-bow, wn suire with the pommel. Complete and original throughout with its original braided-wire wrap grip. In overall fine untouched condition. The blade with its original cutting-edges, a fine point, smooth steel surfaces and some isolated patches light discoloration and patches of light surface-oxidation. 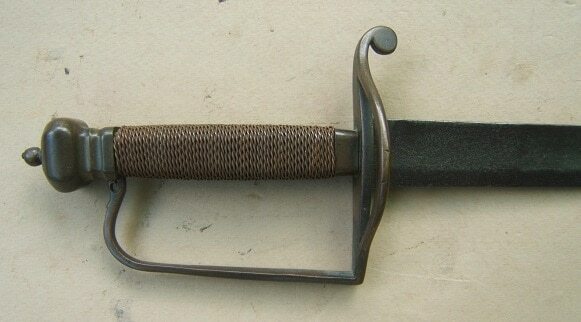 A Classic example of French & Indian War Period, French-type Smallsword, ca. 1750. Made with a finely crafted hilt and blade. Overall length, 31″. Recently discovered in an old Mass. Estate collection. For similar examples please see, G. Neumann: “Swords & Blades of the American Revolution”.